Derek taps into his painfully-obvious-fandom of zombie movies and, for his birthday month, brings The Plague of the Zombies (dir. John Gilling) to the birthday party happening at 1951 Down Place this month. These zombies aren’t interested in eating your flesh, but they are on the look out for tin. 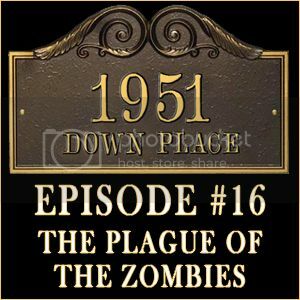 Download 1951 Down Place: Episode #016 here! Allen, Aaron. “The Plague of the Zombies (REVIEW).” The Zed Word – Zombie Blog. Dec 28 2009. Web. 30 Dec. 2012. <http://www.zedwordblog.com/2009/12/plague-of-zombies-review.html>. Johnson, Tom, and Deborah Del Vecchio. Hammer Films: An Exhaustive Filmography. Reprint. Jefferson, NC: McFarland & Company, Inc., 2012. Print. Kinsey, Wayne. Hammer Films: The Unsung Heroes: The Team Behind the Legend. Sheffield, England: Tomahawk Press, 2010. Print. Kinsey, Wayne. Hammer Films – A Life In Pictures: The Visual Story of Hammer Films. Sheffield: Tomahawk Press, 2009. Print. Kinsey, Wayne, and Gordon Thomson. Hammer Films – On Location. Suffolk: Peveril Publishing, 2012. Print. Pirie, David. A New Heritage of Horror: The English Gothic Cinema. New York, NY: I. B. Tauris, 2008. Print. The Plague of the Zombies. Dir. John Gilling. Perf. André Morell, Diane Clare, Brook Williams, Jacqueline Pearce, John Carson. Starz/Anchor Bay, 1999. DVD. The Plague of the Zombies. Dir. John Gilling. Perf. André Morell, Diane Clare, Brook Williams, Jacqueline Pearce, John Carson. Studiocanal, 2012. Blu-ray. Pykett, Derek. Michael Ripper Unmasked. Baltimore: Midnight Marquee Press, Inc., 1999. Print. Raising the Dead: The Making of The Plague of the Zombies. Dir. Marcus Hearn. Studiocanal, 2012. Blu-ray. Sachs, Bruce, and Russell Wall. Greasepaint and Gore: The Hammer Monsters of Roy Ashton. Sheffield: Tomahawk Press, 1999. Print.